So, I hear that Microsoft is buying Internet phone-talk-magic-looky-screen-video-thing Skype for $8.5 billion. I don't really know what Skype is or how it differs from all the other different ways you can talk to people on the Internet, including the one that Microsoft already owns. Hell, I barely comprehend what Microsoft does, apart from ruling the portion of my life I spend on a computer. It involves robotic brain leeches, right? I'm asking three billion dollars, keeping in mind that a bidding war could erupt. In that case, the sky is the limit, but I'll entertain all serious offers. I don't think I have to explain the strategic branding capabilities of this unique offering. A visionary technology partner will see the long-term potential of this acquisition for future cloud-based functionality. Plus it's velvet, a proven robust scalable commodity. 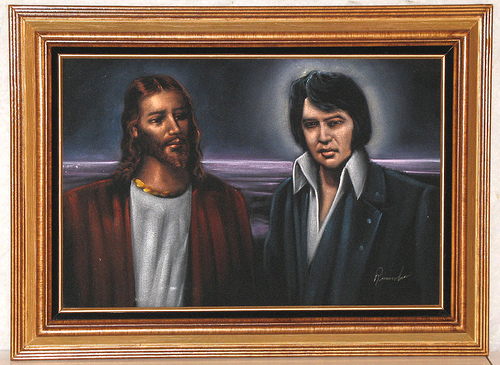 Did I mention it's Jesus and Elvis on a velvet painting? For three billion, the scoreboarding outcomes are a slam dunk. Microsoft has already snapped up the Skype thing. Don't miss out on your chance to own...this. Run the high-bar metrics, and the target revenue models are seamlessly upgradable to back-ended infrastructure. Thanks, and good luck on owning a piece of the future.